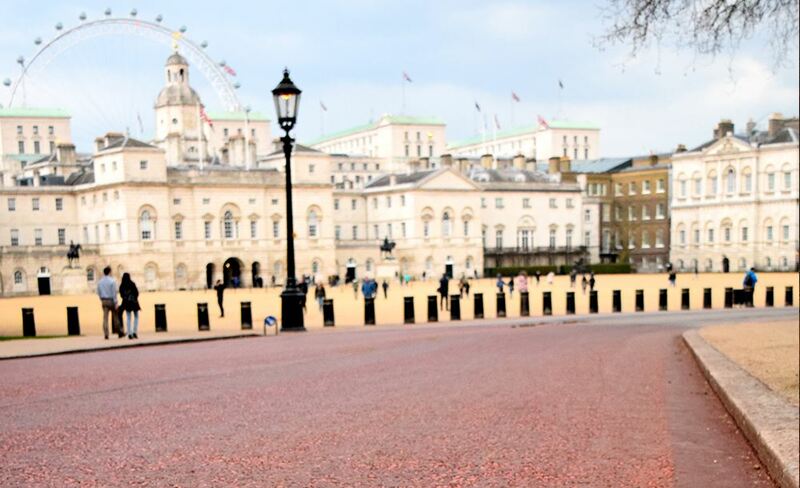 With over 40 years’ experience, Eurovia’s surfacing division has established itself as one of the UK’s market leaders for the provision of high quality carriageway and footway re-surfacing. 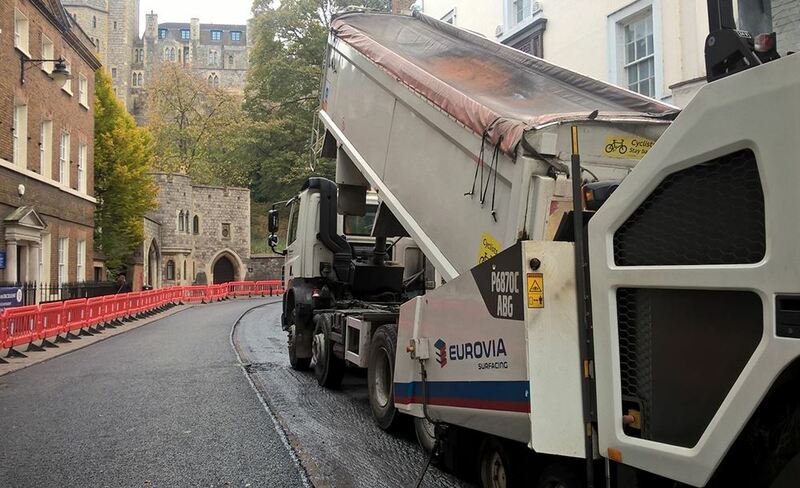 With some of the most modern and innovative plant and fleet in the industry, and dedicated skilled teams, Eurovia’s surfacing division has an accredited surfacing solution to suit all requirements: from maintaining the Royal Parks and the Mall to new carriageway construction, motorways to country lanes, full-depth reconstruction to thin surface course systems. With a spotlight on recycling and reuse of materials, we are continually working with our experts (including JLUK and Eurovia Roadstone) to develop and trial sustainable materials which incorporate increasingly higher proportions of recycled content. 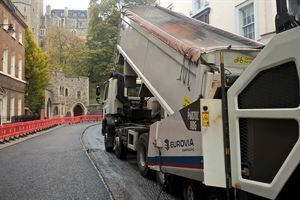 The works were carried out as part of the annual programme of work that Eurovia Surfacing currently undertake on behalf of the Royal Borough of Windsor and Maidenhead. 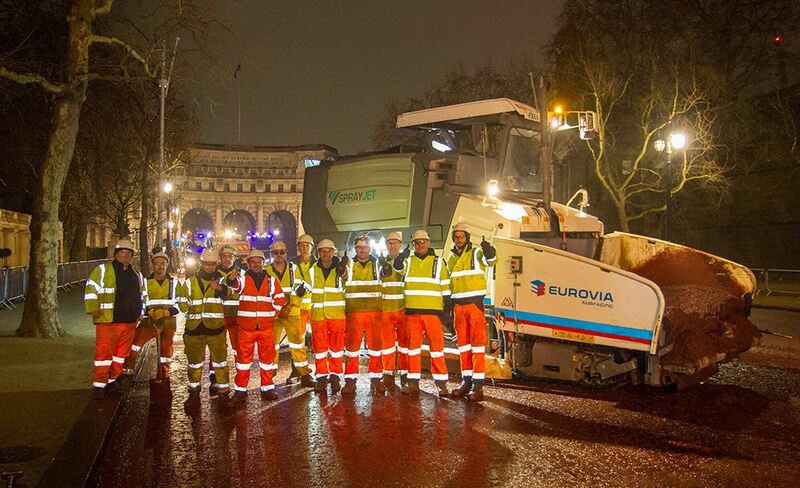 Eurovia Surfacing secured the contract in 2013, re-won it in 2014 and successfully renegotiated the retention of the contract for 2015 and 2016. This is testament to the Eurovia Surfacing teams involved in delivering high levels of quality and service to the client. The works involved planing the existing surface and replacing it with 45mm of a 14mm Thin Surface Course system over an area of 1800m². This had to be delivered in two halves commencing at the lower end on the 1st day and completing the top half up to the castle entrance on the 2nd day. The value of the annual package of works has been approximately £1m per annum with this scheme contributing £36k. Windsor is very popular with tourists and Christmas shoppers during December which made the works slightly more challenging for the teams involved. Despite this, the works were successfully completed on time and to the satisfaction of the client. Ringway engaged Eurovia Surfacing to deliver the extensive resurfacing works on the A322 Bagshot Road and The A322 Coral Reef Roundabout itself. Both schemes involved close co-operation and planning be- tween Ringway Bracknell, JLUK and Eurovia Surfacing. Bagshot Road was completed over 4 weeks of nights and consisted of planing over 12000m² of carriageway at various depths and relaying 12000m² of Geogrid , 3000 tonnes EME 2 , 460 tonnes of SMA binder and 900 tonnes of 10mm ULM. Coral Reef Roundabout surfacing commenced in May 2015 and consisted of six separate visits to fit RIS Bracknell’s work programme the final surfacing visit was completed in March 2016. The work consisted of 1700 tonnes of 32mm Heavy Duty Base , 1675 tonnes of 20mm Heavy duty binder and 940 of 14mm Surface Course most of which was 14mm ULM. These schemes are an excellent example of the collaborative service we can oﬀer our clients by drawing on the expertise of our partner companies to deliver the entire package of works in-house. Eurovia Surfacing secured the contract, valued at £750,000, and commenced works on the 7th September and finished to programme on the 30th September. The works were carried out at night between 20.00hrs and 06.00hrs with the potential of severe financial penalties for late opening to traffic. 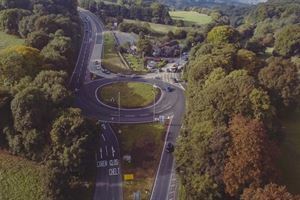 The scheme consisted of major kerb level adjustments on the roundabout and approaches, minor drainage works, electrical works, signage and posts, including the refurbishment of existing footpaths and reshaping and major changes to the levels of the roundabout carriageway surface. Further planing and paving was carried out on the A417 dual carriageway section west of the Air Balloon roundabout. 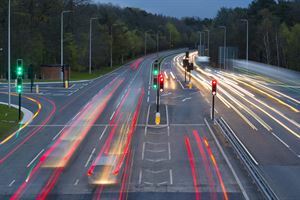 Traffic Management and electrical work for the scheme was delivered in-house by Ringway Infrastructure Services (West Unitaries), and Eurovia Specialist Treatments carried out the high friction surfacing to the approaches on the roundabout. The Contract Manager for the scheme, John Pollard, was well supported by his site staff; Dave Embling, Dave Witts, Jason Dunne and Alfie McNulty. The surfacing was carried out by Mark Lock and Neal Mounty’s team. Brett Coupland – Operations Manager, who is leading the delivery team commented, “We have gone into this £2.2m scheme with a ‘can do’ attitude, solving issues along the way whilst carrying out everything in a safe manner. The guys have worked extremely hard to exceed outputs and our client’s expectations this weekend and they deserve the recognition - well done”. Eurovia use Early Contractor Involvement extensively with their client, Midland Expressway, to plan and programme every element of the works. This includes working very closely with their supply chain partners to ensure that they have not only the best possible programme and methodology, but contingency plans in place should unexpected events or breakdowns occur. Eurovia have extensive knowledge of works on the M6 and other motorway schemes, and have con- tinued to ensure that the works are delivered to the highest quality, in line with their Formula Road approach and in accordance with the specification. 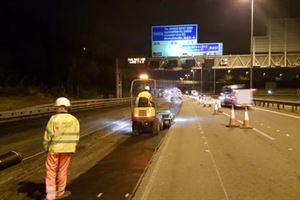 Our supply chain partner, Carillion’s Traﬃc Management teams, were mobilised onto a busy section of the M6 / M42 intersection to close down from 6 motorway lanes down to 3 lanes narrow lane running. Once all of the site surveys, including GPR surveys, had been undertaken Tripod Crest Planing deployed Planers, lorries and sweepers to cold mill approx. 4,700 tonnes over a 24hr period to a depth of 225mm. Site Inspections were carried out by the Client in preparation for Eurovia’s supply chain partner, Asphalt Reinforcement Services, to install CG100 geotextile over a 4 hour period. CEMEX supplied the Eurovia Surfacing machine crew from 2 separate asphalt plants with 1,268 tonnes of asphalt followed by a 2nd layer of 500t of asphalt. All resurfacing works were completed overnight with all single narrow lane traﬃc man- agement removed and opened back up to allow 3 narrow lane running for the general public by 05:30am. Neil Huntington – Regional Director, added: “Eurovia Surfacing have recently received praise from both Highways England and the M6 Toll Board which continues to strengthen our reputation and set us in good stead for bidding the next phase of works on the M6 Toll with Midland Expressway”. 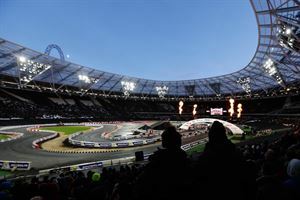 Eurovia were invited to tender for the construction of the race track at the Queen Elizabeth Olympic Stadium following an initial enquiry from Michèle Mouton, track designer for Race of Champions (ROC). This followed Eurovia’s involvement at the event held at the Stade de France in 2008. Working in conjunction with the Race of Champions team, the track was designed by Jean Lefebvre (UK) and Eurovia were awarded the Contract with only 4 weeks to mobilise. During the mobilisation period Eurovia’s project team frequently visited site, liaising directly with the Stadium oﬃcials and ROC, to discuss necessary arrangements for general access/ egress and other logistical requirements such as storage and welfare. Prior to commencement of the works trials were carried out at Eurovia’s recycling depot in Bulls Lodge where Trackway was positioned & planings/asphalt laid on the tightest radius of the track. A selection of graded recycled road planings were laid by a number of alternative pavers, (conventional wheeled & tracked and midi tracked), to establish the most suitable material & preferred method of working. Trials to remove the pavement without damaging the Trackway were also carried out by cold milling, approx. 5mm above the plates & vacuum sweeping the remaining material. The works required protection of the Stadium infrastructure, under soil heating on the pitch, foundations of the running track, underground services & chambers. This was achieved by us- ing aluminium plates, Trackway, directly onto the pitch, along with Terram2000 on the running track & steel plates on various chambers & slot drains. A full topographical survey was carried out to ensure surface water drainage on the completed track was adequate. Concrete barriers were placed on the perimeter of the track as a safety precaution to the spectators. The surfacing works were completed in 5 days and the finally the road markings and high pressure sweeping of the track were carried out before handing back to ROC. Following the successful staging of the event, Eurovia’s team remobilised to remove the track and hand back to the Stadium to allow transition works to recommence, converting the stadi- um to the future West Ham United FC ground. The removal was substantially completed in 25 hours. In all some 3,000 tonnes of recycled road planings and 2,000 tonnes of asphalt were supplied and laid, and subsequently removed, during the contract. All the recycled asphalt planings was supplied by Eurovia Roadstone and used initially as a sub-base and following removal of the track, all the subsequent asphalt planings were taken back to a recycling facility for re-use, either as a Type1 or 4 sub base or as RAP in new asphalt.